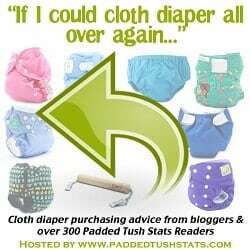 Tara of Padded Tush Stats asked a simple question: If you could start cloth diapering all over again, what would you buy? That’s a tricky question. Would money be an object? Or would it be the cloth diaper stash of dreams? I’ve been pretty fortunate. Over the past three and a half years, I’ve been able to build a cloth diaper stash of dreams. It’s excessive big. It’s bright. It’s cheerful. It’s fun. But really, there are some things that I would do if I started all over again to make my cloth diaper stash of dreams on a smaller less excessive scale. I would have seriously raided several WAHM diaper makers much earlier than I did. I’d have about half a dozen yoke style (or Flip style) diaper covers by Diapers by Chris. I’d have three or four hybrid fitteds. And then, of course, I’d have to go on an Ella Bella Bum raid. I’d go with… half a dozen Ella Bella Bum pocket diapers with an athletic wicking jersey inner. But since I’m dreaming here, I’d probably add a couple of Jelly Bear Boutique diapers and Harp Diapers to my stash to further develop my cloth diaper stash of dreams. I’d definitely keep the Best Bottoms diapers that I have. I love them for how well they fit all of my littles, big and small. Blueberry has made some beautifully patterned diapers over the years. I desperately love my Butterflies print and would keep them for my start over stash for sure! Really, though, the more I think about the Cloth Diaper Stash of Dreams, the more I realize that I already have the cloth diaper stash of dreams. Why on earth would I want to start over? I’d have exactly what I have for the children that I have. I’d probably add a few and maybe sell off a few as I go, but that’s part of the usual ebb and flow of my cloth diaper stash anyway. If you started cloth diapering all over again, what would you start with? If I had it all to do over again I would have stuck to swaps and co-ops and never bothered fussing with anything else. I have one WAHM that held up well, the rest have not. They were relatively affordable, but I’m in this for the money saving aspect, so $4 Sunbabies (that have yet to leak or laminate) win out for me and mine. If I could have a stash o’ dreams I’d probably buy a lot from a variety of Etsy sellers that are up in the $$$$$ range, but I’d still probably default to the imports. If it’s not a WAHM they’re all pretty much made in the same places anyway, only difference is branding and distribution. With China Cheapies, they *are* pretty much made in the same place with different branding. However, I’m leaning more and more towards diapers that are made in the US/Canada. I probably would just stick to snaps because babies can easily remove velcro lol. I don’t mind my Rearz and Alvas, but I do prefer my Lil Helpers and Funky Fluff. I also would probably have supported more WAHM as well. There are so many options out that that you can meet your needs easily.